Why: The menorah lighting was instituted as a publicity strategy: advertising to the entire world that G‑d makes miracles for those who stand up for truth and justice. When: The Maccabees chased away the forces of darkness with swords; we do it with candles. That’s why we light the menorah shortly after sunset. Two exceptions: On Friday evening, light the candles before sunset. On Saturday evening, light them after dark. Where: Wherever you happen to be living at the time. Set up the menorah in a central doorway, near the doorpost opposite the mezuzah. Others have the custom of placing it on a windowsill facing the street. The Chanukah miracle involved olive oil, so that’s the fuel of choiceWho: Every Jewish person—men, women and children. In many homes, the head of the household lights one menorah for everyone. In others, everyone lights their own. Some light one candle and let the kids light the rest. The Menorah: The Chanukah miracle involved olive oil, so that’s the fuel of choice. But you can use any candle that will burn until one-half hour after nightfall. Electric menorahs are good for decoration, but you need the old-fashioned one to fulfill the mitzvah. Get everyone around the menorah. Light the shamash (“attendant”) candle. While standing, recite the blessings found in the prayerbook. Light the candles. 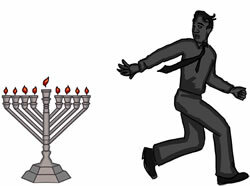 On the first night, set one candle to the far right of the menorah, and add each night towards the left. Each night, light the newest candle first, and continue lighting from left to right. Add from right to left, light from left to right. Place the shamash in its place on the menorah, and sing the “Haneirot Halalu” and/or “Maoz Tzur” Chanukah hymns. Linger around the candles for about half an hour (except for Friday afternoon). Share some Chanukah stories with your family, enjoy a dreidel game, and indulge in some hot latkes! For more information, check out our Menorah Wizard. Illustrations by Yehuda Lang. To view more artwork by this artist, click here. The Menorah I was taking an opera class today and it was Verdi's opera, Nabukko, that was highlighted. Shaul Wolf Chabad.org, Electric menorah Technically you have a very good argument, based on inescapable logic. However, the same logical argument can be made in support of the Electric Menorah. Chanukah, as we all are very familiar with, is referred to by all the Rabbis as the "Festival of Lights". Alternatively, Chanukah is not and never was referred to as the "Festival of Fires" or the "Festival of Flames". Re: Electric menorah The menorah that we light was instituted to commemorate the menorah that was lit in the Temple, which used real fire. We therefore light a menorah using real fire as a commemoration. NOT SURE HOW TO EXPLAIN IT. FOR 1. Anonymous, 1/14/2014 "WHAT?" I have no idea what this Anon means. The Menorah For me, the world is filled with menorahs. Its the branching of the tree limbs, it's the branchings everywhere of plants. It's the branching veins in my body. I see candelabras everywhere, and for me, it's also the letter SHIN itself, that Hebrew letter. Regard the Shin carefully, and maybe you will see what I see. As for English we do have the SHIN in shine itself.